The news channels delivered a narrative that said the #Mandir march was a make-or-break situation for political parties. There’s a camel. There’s another camel. They stop by a wayside shop in the middle of a desert and ask for a bottle of water. Bisleri. The shopkeeper obliges; camels slake their thirst, then spray the water on the man. ‘Are we donkeys? Give us real Bisleri’. This delightful commercial is perhaps an apt observation on the melodrama in Ayodhya last weekend: was it the ‘real’ thing or simply ‘posturing’ and threats (News India) by various groups, including the Shiv Sena, which suddenly appeared in Ayodhya, to ‘jump onto the Ram bandwagon’ (Republic) in a ‘rush to claim’ (CNN News 18) the high ground on ‘Mandir mobilisation’ (Times Now)? In the saffron sea wave, men of all shapes, sizes and ages shouted slogans each time they went live on TV: ‘Hum mandir banake jayaenge’(ABP). An elderly man in orange blew a conch and added menacingly, ‘At any cost. No power can stop us. We won’t give an inch… those who oppose us will be destroyed’ (Zee Hindustan). Is this 1992 redux or, with apologies to the animal, making a ‘donkey’ of us? 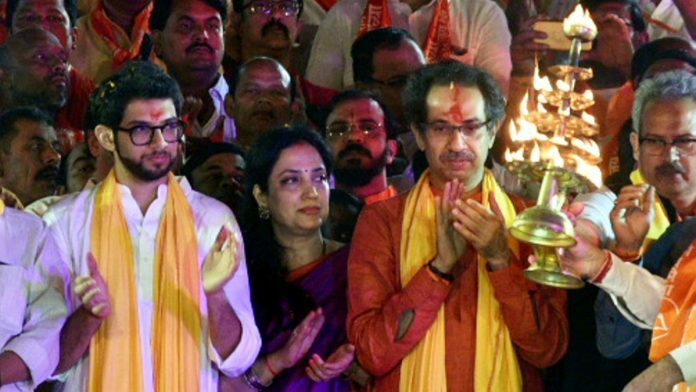 The Shiv Sena supporters with chief Uddhav Thackeray there for an ‘aarti’ Saturday, before the VHP ‘dharma sabha’ Sunday, were belligerent, boisterous and not too modest: ‘We had said we would bring down the mosque, we did; now, we will build the temple’ (News India). Aaj Tak replayed Shiv Sena founder Bal Thackeray’s claim after the 1992 Babri Masjid demolition that ‘we broke it’. Why the faithful who claimed to have demolished the mosque on national TV were allowed to boast of their alleged past exploits or present threats, and not arrested? More ‘posturing’? Or electioneering? Listen to BSP chief Mayawati: ‘How is it that as elections approach they remember Ayodhya?’ ‘BJP ki chaal’, replied Congressman Kapil Sibal (News India). The news channels delivered a narrative that said the #Mandir march (News X) was a make-or-break situation for political parties, a ‘dharm yudh’. And they were excited by the prospect – none of them existed on 6 December 1992 when the Babri Masjid was razed. India Today’s ‘Long Story’ reminded them of the build-up to that day. In a speech during his rath yatra, BJP’s L.K. Advani spoke of creating a ‘patriotic and nationalist vote bank’ – sounds familiar today? So we and the TV waited to see what would happen with Uddhav Thackeray at Laxman Qila: ‘He will be on the stage with the sants and sadhus’(India Today). After prayers at Saryu embankment and finger-pointing at the BJP, the Sena chief boarded his aircraft with a wave of goodbye. For the dharma sabha, TV reporters wore orange kurtas and toothy grins – some even recited a poem, a shlok, like the Zee Hindustan lady: those here are devotees, she claimed, although many young lads looked like they were holidaying. She approved of the seating arrangement, the stage decked in flowers: everyone ‘josh mein hai’, not the least herself. Some were more distraught. NDTV India found in Begumpura that Muslim women and children had left home for the weekend amid fears of violence. These were mercifully belied. ‘Yogi (Uttar Pradesh CM) will not allow a leaf to move,’ remarked a studio panelist (Zee). ABP found police barricades everywhere, News India saw police everywhere. ‘Ayodhya Kand’ (Zee News) ended with chants of ‘abki baari, mandir ki taiyaari’, and the PM attacking the Congress for obstructing the temple at a campaign rally and a veiled attack on the Supreme Court. In an interview with Zee News, BJP president Amit Shah said ‘no ordinance for now’ as the government abides by the SC. All very confusing for the viewer. Do We The People really want a temple in Ayodhya, ‘at any cost’, now? No one is asking us. Is this a ‘hot’ issue or just a lot of election ‘hot air’? Zee News UP/Uttarakhand asked: ‘Can a temple be built on atmospherics alone?’ On TV, it certainly seemed that like castles, it could be built out of thin air. The PM’s Mann Ki Baat was the other big Sunday show stopper. Episode 50 on DD was celebrated as a significant milestone and certainly this ‘fireside’ chat has seen the PM address many social issues that need addressing. Sunday, Modi began by recalling how his radio show began – with a chai wallah of course. No, not him, but someone he met on the day of Vajpayee government’s Pokhran nuclear explosion in 1998. The PM fielded queries about the programme, spoke of the aspirations of 130 crore Indians – yes, he has moved on from 1.25 crore in earlier speeches – celebrated the Constitution, B.R. Ambedkar and the Kartapur corridor. People in Uttar Pradesh, Rajasthan, Himachal Pradesh, Uttarakhand and Haryana – BJP-ruled states – were shown watching something somewhere, and listening intently. At some places they were seated as if at a function. A few took selfies. Perhaps, like the youngsters in Ayodhya, they were on holiday, too. After all, it was Sunday….